If you perform any work in low-light conditions, at night, or on vehicles with heavily tinted windows then this windshield mounted flashlight is a must-have. The light suction cups to the windshield providing a floodlight effect, illuminating the vehicle making your job much easier. The longest lenth of vinyl coated long reach tools available. Features Store-N-Go handle. 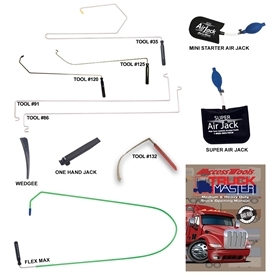 This is the ideal Jack Set for anyone who wants the extra length of the Big Max long reach tool, and the larger sized Super Air Jack air wedge. A favorite for decades, this flexible tool features a gritty material in the center which grips most vertical buttons with ease. Make your own custom Complete Lockout Set by selecting the components you like best. Make your own custom Lockout Kit by selecting the components you like best. Our very popular tool set that includes virtually all of the tools and accessories needed for a long reach lockout in a compact size and design. 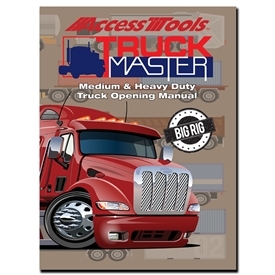 This extra-long tool will take the ideal shape for those hard to reach lockout jobs. The perfect Jack Set for any DIY individual who will only be opening cars on an emergency basis and is not an industry professional. 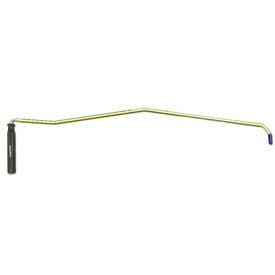 A standard length, flexible vinyl coated long reach tool great for vehicles that require a special tool. An excellent gift for any special occasion, a Gift Certificate allows an individual to pick out whichever tool they may need. Replacement accessories for your favorite long reach tool. The perfect Jack Set for anyone working in low-light conditions where the LED tip on the Lightning Rod sheds much needed light inside the vehicle. The perfect long reach for anyone working in low-light conditions where the LED tip on the Lightning Rod sheds much needed light inside the vehicle. 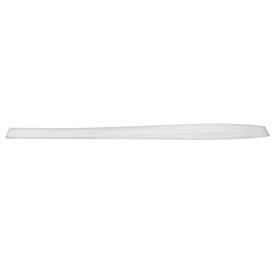 A shorter length vinyl coated long reach tool great for smaller vehicles. Features Store-N-Go handle. This rack holds your long reach tools and installs in the back of virtually any tow truck or pickup truck with no vehicle modifications or tools required. A variant of the popular Emergency Response Kit that includes the Access Smart Light for low-light condition lockouts. The Mega Master is a flexible snare-tool twice the length of the Button Master, with a loop large enough to grab door handles and loose keys inside the vehicle. Based on the popular One Hand Jack Set, this variant trades the Carrying Pouch for a Long Carrying Case that will hold all of your tools. Heavy Duty Collision Film designed to protect a vehicles interior during transport and storage. Cover any broken or damaged window or windshield. 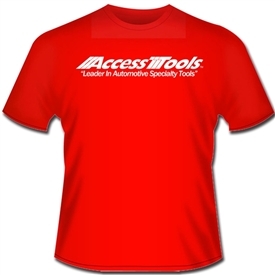 The popular Snap-N-Lock tool including the accessories that make the tool more usable with the LED lighted tip, magnetic tip, and loop tip for vertical button vehicles. The only two piece tool on the market that does not screw together. 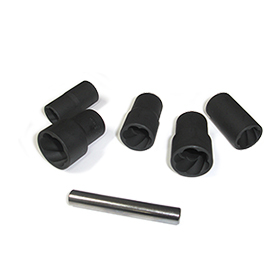 The Snap-N-Lock design ensures a strong, durable, easy to use connection that allows the long tool to break down for each storage and transportation. Designed as a replacement to the key and crank included with vehicles that feature spare tires mounted underneath the vehicle. Rather than search for the customers key and crank, which can be time consuming and dangerous, the Spare Tire Kit makes this job a cinch. 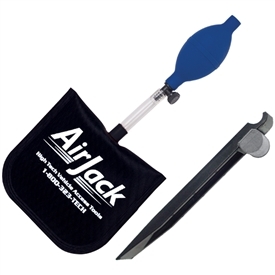 This Jack Set variant includes the larger Super Air Jack� and both sizes of the One Hand Jack tool. 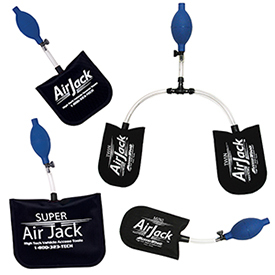 This Jack Set variant upgrades the Air Jack� in the One Hand Jack Set to a Super Air Jack� for this set. 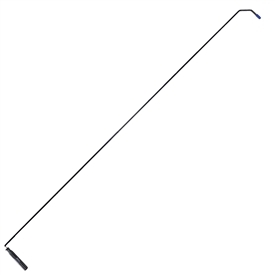 The shortest length vinyl coated long reach tool great for certain vehicles with square vertical lock buttons. This trio of Long Reach Tools is a great package, ensuring you always have the right tool on hand. The only Jack Set that includes both the Twin Air Jack� and Mini Starter Air Jack�, in addition to the Button Master, allows you to conquer almost any vehicle. Powered multi-tester probe tool that aids in the diagnosis and testing of any automotive issue. An economy Jack Set that does not come with a Carrying Case.